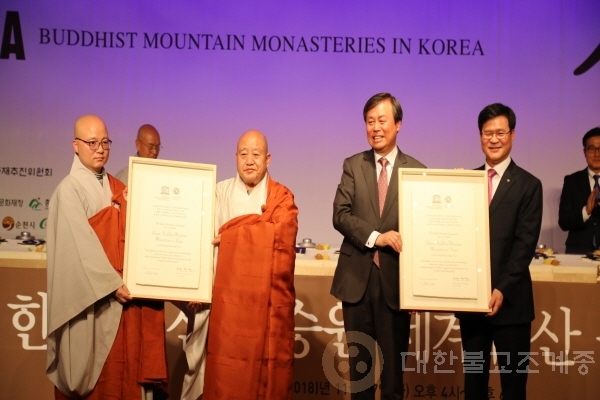 The Chairperson of the Steering Committee for the Nomination of Sansa, Venerable Wonhang, who is also the President of the Jogye Order, held a congratulatory ceremony for the acknowledgement of “ ​Sansa, Buddhist Mountain Monasteries in Korea​​​” as it was added onto the UNESCO World Heritage List. The ceremony was held in the Grand Ballroom of the Grand Hilton Hotel on the 27th of November 2018. 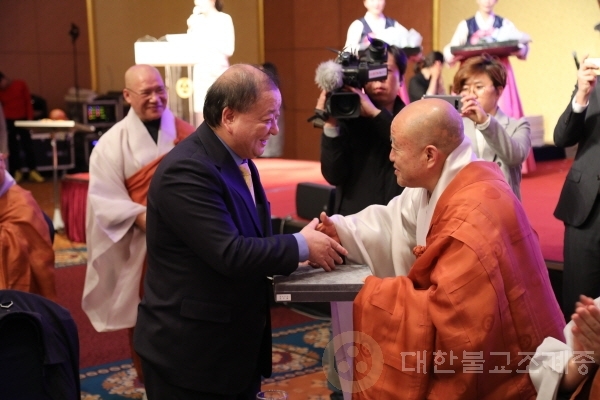 On that day, Venerable Wonhang, the President of the Joyge Order; Do, Jonghwan, the Minister of Culture, Sports and Tourism; and Lee, Si-jong, the Governor of Chungcheongbuk-do Province, came to celebrate the occasion, along with over five hundred other attendees, ranging from political and economic leaders to high-profile government officials, as well as Buddhist monks and devotees. 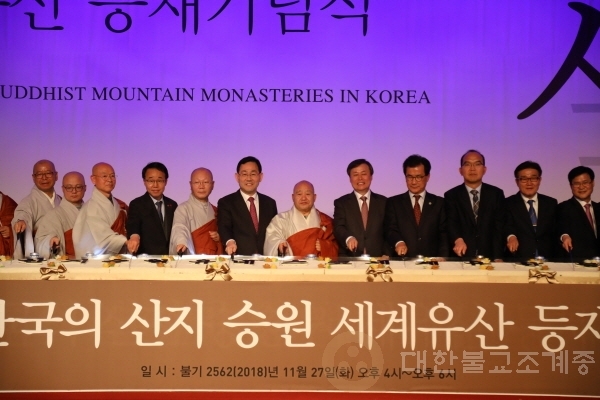 The project to designate “Sansa, Sanjiseungwon, or Buddhist Mountain Monasteries in Korea” on the UNESCO World Heritage List embarked on its journey in April 2011. At that time, the president was informed of the plan to apply for the inclusion of our traditional temples onto the UNESCO World Heritage List through the Presidential Council on Nation Branding. The following June, the selection of the temples was made, and in December 2013, the seven monasteries were categorized as parts of a tentative list. In 2014, the Steering Committee for the Nomination of Sansa was established. Since then, everyone involved in the project has worked day and night to achieve the listing of the temples. At last, on June 30, 2018, at the 42nd meeting of the World Heritage Committee, the entry of the seven temples onto the UNESCO World Heritage List was officially announced. 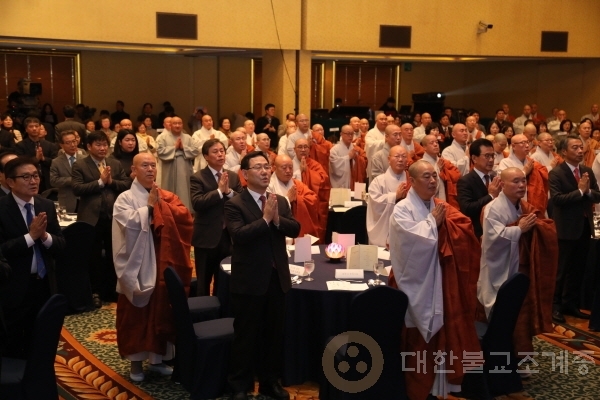 At the 42nd meeting of the World Heritage Committee meeting held in Manama, Bahrain in June 2018, “Sansa, Buddhist Mountain Monasteries in Korea​,” officially become the 13th Korean addition to the UNESCO World Heritage List. This occasion is the fruition of the collective efforts of a great many individuals invested in this project, and also reflects the hopes and support of the Korean people as a whole. On this joyous occasion, we wish to express our utmost gratitude to all central and local government officials for their endeavors to help bear this precious fruit. The designated mountain temples that have been added onto the UNESCO World Heritage List are: Tongdosa Temple (Yangsan, Gyeongsangnam-do), Buseoksa Temple (Yeongju, Gyeongsangbuk-do), Bongjeongsa Temple (Andong, Gyeongsangbuk-do), Beopjusa Temple (Boeun, Chungcheongbuk-do), Magoksa Temple (Gongju, Chungcheongnam-do), Seonamsa Temple (Suncheon, Jeollanam-do), and Daeheungsa Temple (Haenam, Jeollanam-do). These temples have managed to wholly preserve the traditional monastic culture that began with the transmission of Buddhism into the Korean Peninsula. They represent the unique characteristics of Korean traditional monasteries. Established between the seventh to ninth century, these seven temples are the epitome of Sansa, still standing strong and worthy in their original locations for over a thousand years. Now, these monasteries are places filled with the energy of religious devotion, practice, and living spaces as vibrant parts of our cultural heritage. "Sansa, Buddhist Mountain Monasteries in Korea,” is a comprehensive listing, containing both the tangible and intangible assets of the entire history of Korean Buddhism. Over 1700 years, Korean Buddhism flourished greatly during the Silla (57-935) and Goryeo (918-1392) periods. Even during the darkest period, the Joseon Dynasty (1395-1910), operating under the policy of promoting Confucianism while oppressing religion, Buddhism continued to carry out its religious and cultural duties solemnly. During the Japanese Invasion in 1592, in the midst of the vortex of wars in the mid-Joseon period, Sansa became bases for many monastic soldiers. Afterwards, these monasteries offered comfort to distressed survivors, and also played a significant role in unifying the country. 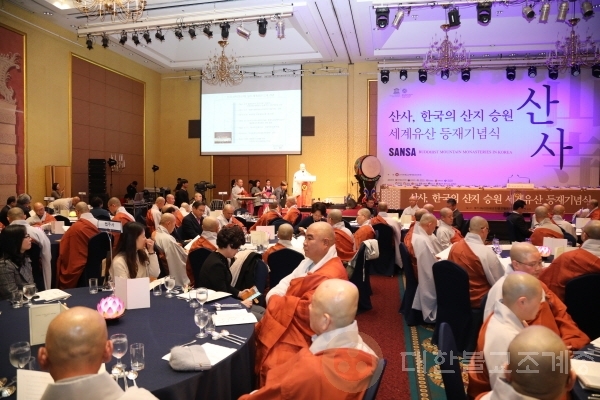 Because Sansa took on these various responsibilities in society, Korean Buddhism was able to maintain its order. The addition of Korean Sansa to the UNESCO World Heritage List is deeply significant, as this event means it is finally receiving worldwide recognition for its extensive and intricate cultural value. Even so, the process of getting registered onto the UNESCO World Heritage List was anything but easy. It all began in 2011 when the decision was made to go ahead with the application for the UNESCO World Heritage List. Over the past eight years, it took a great many people and a great deal of effort until “Sansa” was officially added as a part of the world’s heritage. In order to do this, the abbots of the seven temples provided their unwavering support, along with the minister of the Cultural Heritage Administration, the governors of the provinces where the monasteries are located: Chungcheongnam-do, Chungcheongbuk-do, Jeollanam-do, Gyeongsangnam-do and Gyeongsangbuk-do; the mayors of Gongju City, Suncheon City, Andong City, Yeongju City, Yangsan City and Boeun City; as well as the heads of local organizations in Haenam-gun, who have all worked hard behind the scenes. We would like to offer our sincere thanks to each and every one of them. In particular, it is only fitting to offer our official appreciation to several individuals who have dedicated their heartfelt efforts to the cause: Kang, Chang-il, member of the National Assembly; Lee, Baeyong, the director of the Division of World Cultural Heritage of the Cultural Heritage Committee; Lee, Hye-eun, the president of the expert team of the Steering Committee for the Nomination of Sansa; and Guo Zhan, the vice president of the World Heritage Expert Committee of China. As it joins the two other inclusions on the UNESCO World Heritage List, the Seokguram Grotto and Bulguksa Temple, along with Haeinsa Temple Janggyeong Panjeon, the Depositories for the Tripitaka Koreana Woodblocks, the Jogye Order of Korean Buddhism will continue working to preserve the value of monastic cultural assets of Korea that have been carefully maintained for the last 1700 years. Furthermore, we will do everything in our power to preserve its extraordinariness as part of the UNESCO World Heritage, which all of humanity can share and love. It has been a great honor and pleasure to celebrate this meaningful occasion with all of you. May your good deeds of today reflect positively on your everyday life with the blessings of true Buddha-dharma. Thank you very much.